We’ve come to that time of year where we’re no longer in the dead of winter, but not yet in the bloom of spring. We’re at the crux of transition. The ice is melting in some parts of the world. The days are once again getting longer, the leaves are returning to the trees, & the flowers are beginning to bloom. Here in San Diego we were hit with a pretty large rainstorm this past weekend, & it seemed as if the roses in my garden opened overnight. 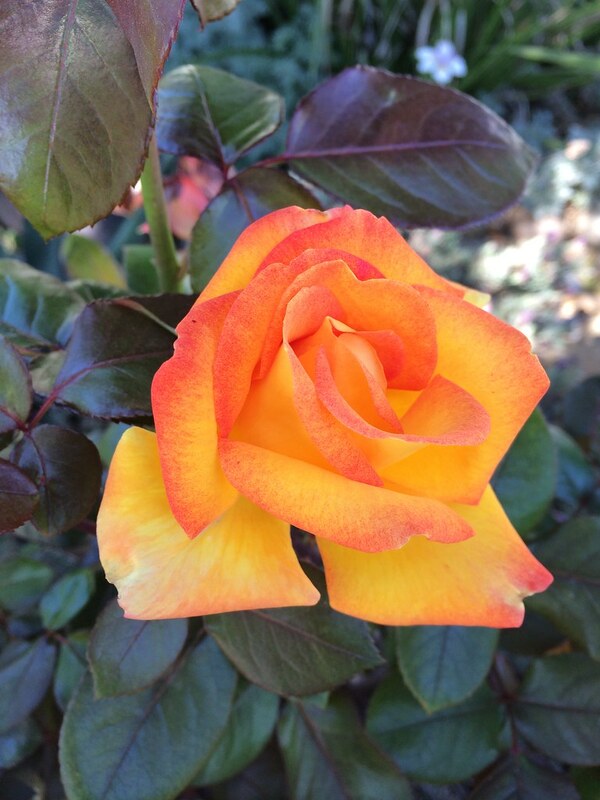 This is the first rose to fully bloom. So beautiful! In Ayurveda these signs indicate the passage from “Vata” season (which governs fall & early winter), into “Kapha” season (which governs late winter & spring. As we embark on this seasonal transition, it’s a wonderful time to adjust our diet & lifestyle patterns to ensure we stay well & in harmony with our environment. Therefore, it is time for us to begin shifting towards more “kapha dosha pacifying practices” that will keep us warm, dynamic, & joyful. For today’s wellness post, I am sharing the wisdom of yoga teacher & Ayurvedic consultant, Kate Schwabacher, on how to make a smooth & mindful transition. In Ayurveda, ‘Ritu Sandhi’ is the Seasonal Juncture (which in southern California we begin to experience in late February/early March): the time between winter and spring. In this juncture we start to transition our habits from winter palliation to spring awakening! ~ Savor the last of winter’s hearty produce for soon it’ll be spring’s naturally cleansing fare of sprouts & greens. So this month enjoy the last of the foods you’ll be saying so long to next month: Avocados, Pumpkins, Winter Squash, Tomatoes, Bananas, Dates, Figs, Oranges, & Nuts & Seeds. ~ If you’re prone to springtime ailments like allergies, water retention & lethargy start to avoid the most aggravating foods for spring: dairy, red meat, nuts, sweeteners (other than honey) & excessively salty foods. ~ Start to integrate more spring in your step as the sun starts to come up earlier! Wake up early (before sunrise) & start your day with some vigorous exercise to clear your mind & refresh your body for the day ahead! ~ Try something new! While routine is great for calming the nervous system in the winter, routine can bog us down in the spring. Try a new yoga or exercise class, cooking a new recipe, hiking up a mountain for a new view on the world, or making a new friend. Get out & see what this beautiful world has to offer! As Kate mentioned, we are going to start seeing a change in the produce offered at the farmers’ markets & in our CSA boxes, so it is time to make the most out of the last of winter’s bounty. It is this time of year that an abundance of beets come flowing my way, & I challenge myself to come up with new ways to enjoy them. As I’ve been making a habit of preparing a seasonal kitchari each week inspired by my CSA delivery, I decided to once again, add beets to the mix, but this time, rather than roasting them separately & adding them in to the final dish, I cooked the beets along with the bean & rice mixture to create a beautiful jeweled dish! For an extra boost of nutrition, I utilized the beet greens as well, which are delicate, surprisingly sweet & mild, & very nutritious, as they are high in vitamins & minerals: A, C, K and fiber, iron and potassium. For this recipe I also used a spilt mung dahl & a prepared kitchari spice mix that I purchased through Banyan Botanicals. I really liked the texture of the spilt mung, versus the whole variety that I had cooked with previously, & the kitchari spice blend was lovely. To make life easier, you can purchase an entire “Kitchari Kit” here – complete with rice, mung dahl, kitchari spice & a recipe. How convenient! Wash rice & mung dal & soak overnight. Drain soak water. In a medium saucepan warm the ghee or coconut oil. Add the kitchari spice mixture & sauté for one to two minutes. Add rice & mung beans & sauté for another couple of minutes. Add 6 cups of water & bring to a boil. Once the kitchari has come to a boil reduce the heat to medium-low. Cover & cook until it is tender (approx. 30-45 minutes). Add the beets halfway through cooking, & add the greens in the last 5 minutes of cooking. Add Himalayan salt to taste & garnish with fresh cilantro & shredded coconut. 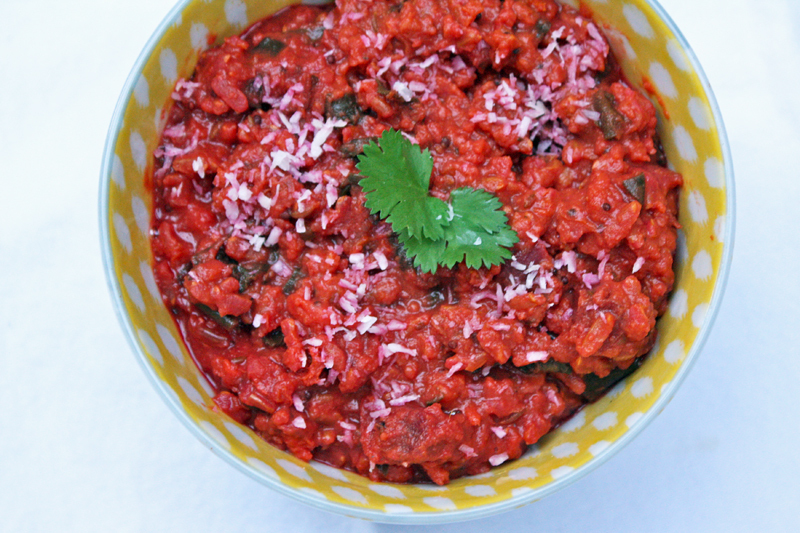 While enjoyed this variation of “ruby red” kitchari, I’ve definitely have had my fill of beet this season, & tubers & root veggies too. I am really craving lighter vegetables & raw greens. I cannot wait to make spring kitchari with basil, asparagus & peas! Keep your eyes peeled for that. What winter produce will you miss? What are you most excited for in spring? Bring on the new season! I am ready. Oh this is your lovely site Melissa! I shall have to subscribe. 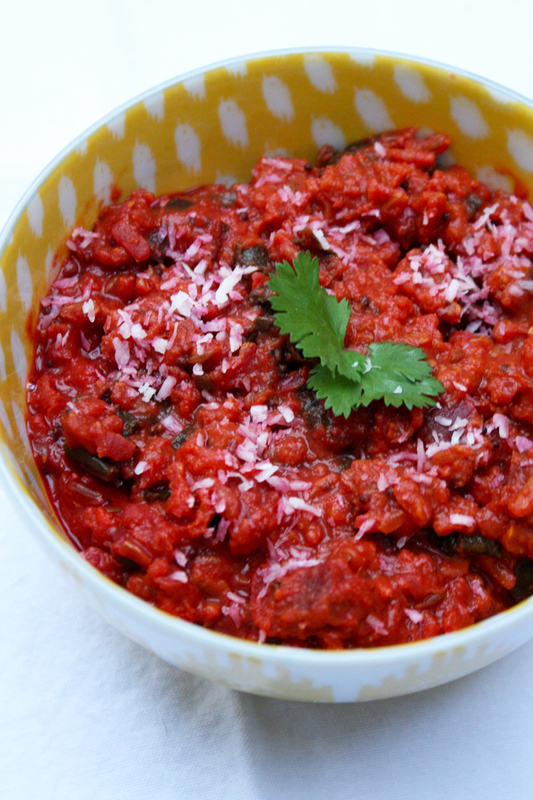 Beets are my favorite and I never thought of cooking with the Kitchari. Thank you for this!